Chiaka Desmond, whose pan-African identity has shaped her vision of the world of cinema, is co-founder and editor of Film Biz Africa Magazine. She talks about her evolution into this world that she realized very early was where she wanted to be. You are the co-founder and editor of Film Biz Africa Magazine, the bi-monthly print and online film/media business magazine. Talk a bit about your background and how you became interested in the world of cinema. I was born in Nigeria, raised in Ethiopia and lived in Kenya for seven years and six months. My life has been an amalgamation of cultures. I believe being exposed to so many cultures made me very open minded and aroused my curiosity in the world of cinema as I also believe film has a way of preserving culture and will forever be intertwined with culture. I love how you can go to a whole other world just through watching a film. I also studied Broadcast Journalism at the United States International University in Kenya. One of the courses we did was called ‘Television and Film Production’. Our teacher, Mr. Sylvester Mutua really opened up our minds to the critical role cinema plays in our society and one of the challenges each of us was given was to produce a forty-page script for adaptation to film. For the first time in my life, I became so imaginative and unleashed a Pandora’s box of creativity I never knew I had in me. I also did my undergraduate internship at Film Studios Kenya, (one of the oldest film production companies in Kenya). The lights, the cameras, the sound equipment, the cranes, the gibs, the dollies and the studios were so huge and exciting that I knew what I wanted in my life from the very day I set foot at the film studios. African women in cinema play various roles, as filmmakers, producers, actresses, in technical roles, organizers, curators, critics, and well, film magazine editors. What inspired you to create Film Biz Africa? As I said earlier, I fell in love with cinema the first day I set foot at Film Studios Kenya, but I realized, all throughout my college years, I never had access to any books or magazines on African cinema, not even blogs or websites! So, after my four-month internship at Film Studios (on the set of the Patricia Show), I found myself armed with a B.A Degree in Broadcast Journalism, but jobless and idle. If there’s anything I hate in this world is being idle, so I decided to start writing. I’d interview people for the fun of it, go for events and before you knew it, I had a magazine dummy ready for Kenya’s film industry. After I shared my concept with my father, he told me to expand it to cover the whole continent because there wasn’t any magazine that really covers Africa’s film industry well, so I took up the challenge and today, I have no regrets! Your organization is part of an extensive social media network, such as Facebook and Twitter. What role do you see social media playing in the promotion of African cinema. In my opinion, social media is becoming the nucleus of marketing. If you have a film, or any product for that matter these days and you are not active on social media, I’m afraid you may have made your product for yourself and your friends! You are based in Kenya, could you talk a bit about the reception of the Magazine in both Kenya and across Africa? I honestly thank God for the time I had in Kenya. I lived there from January 2006-September 2013. Kenyans are good people, forget the negative news you hear about Kenya, it’s a great country full of innovative and creative young people. I had so much support from the locals, and speaking Swahili only made things easier for me. The magazine was so well received in Kenya, that at a point I had more Kenyan readers than any other country. How does the magazine interface with Kenyan cinema culture? I believe Film Biz Africa has been one of the biggest promoters of Kenyan and East African cinema of all time. We did features on so many celebrities, organized thousands of photo-shoots, did a number of events, brought investors to the industry (through our event the Africa Media Business Exchange), and still plan to do a lot more in Kenya. The Film Biz Africa Magazine plans to celebrate African women in cinema with the October 2013 issue, why do you think this celebration is important? Firstly, October is a month where a lot of women-centered campaigns go on. Throughout my career at Film Biz Africa, I realized there was more men than women producing films in the continent, yet, the few African female producers, scriptwriters, are so brilliant at what they do but are rarely celebrated. This October issue is a special issue that will celebrate as many African female producers, Scriptwriters, Directors and the likes. Future initiatives of Film Biz Africa? Good news for West Africa, we’re setting shop there in a few weeks time! Good news for South Africa too, we’re also setting shop there soon! We’re also going online, mobile, and TV. We at film Biz Africa believe we have no limits, we want to say, we came, we saw and we conquered, and trust me, we will. 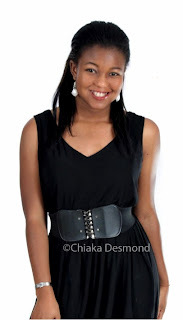 Interview with Chiaka Desmond by Beti Ellerson, August 2013.